This block is a short and minimally invasive procedure which can be used to treat acute and chronic pain in the head and the face. Because this procedure involves a large needle penetrating the skin and the deeper tissues in your body there is a small amount of pain associated with it. However, it is for this reason that local anesthetics are used to alleviate the amount of pain you feel and the discomfort. If you are particularly sensitive to pain or discomfort you cannot for an intravenous sedation. Should you choose to undergo intravenous sedation you can also have local anesthetics applied in addition. What happens during the Sphenopalatine Ganglion block procedure? During this procedure you will be positioned accordingly so that the block can be injected. 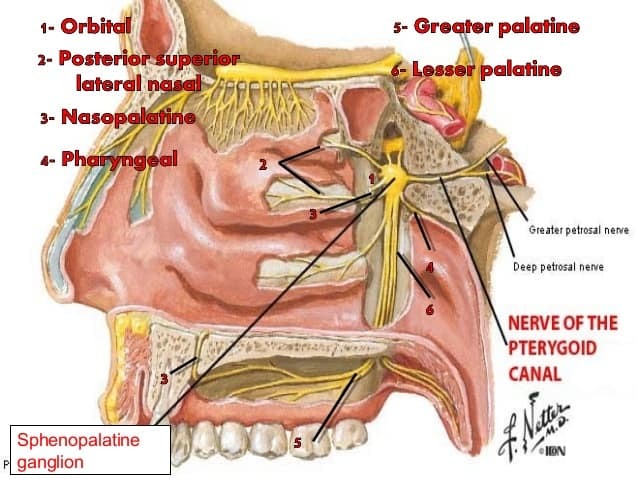 There are three approaches to this block including transnasal, transoral, or lateral. Transnasal is the most common of the methods and it is the simplest. This particular method has you lie down on your back and extend your neck as though you were sniffing. During this procedure the personal injury doctor will introduce a sterile cotton tipped applicator which has been dipped in an anesthetic and will advance it into your nose until it reaches the posterior wall. This applicator will be left in the same position for approximately 20 minutes. Once this is done the Arizona workers compensation doctor will use an x-ray to guide the small needle and to confirm that the positioning is correct before they injected anesthetic. This procedure should take approximately 15 to 30 minutes at most. The same method is used for the remaining two approaches wherein your personal injury doctor will use the applicator and the anesthetic and will inject the needle after the x-ray has confirmed that the positioning is correct. Again, if you opt for Trans oral or lateral approaches it should take approximately 15 to 30 minutes to complete the procedure. What happens after the Sphenopalatine Ganglion block procedure? If you opted for sedation you will require someone else to take you home. You should not drive or operate heavy machinery for 24 hours after the procedure. If you only opted for local anesthetics you can drive home after you have waited for a few hours under observation. What are the risks involved in this Sphenopalatine Ganglion block procedure? As with any procedure there are some risks but because this is minimally invasive the risks are quite low. Some of the most common side effects associated with this procedure include a bitter taste in your mouth after the anesthesia as well as a nosebleed. In other cases you may experience lightheadedness for the first 30 minutes following the procedure. What can I expect after my Sphenopalatine Ganglion block procedure is complete? This block is a well-established treatment for this type of facial and head pain. In the first few days following the treatment you will find that your pain decreases significantly in most cases. Should the pain not decrease you can return for alternative procedures or second block.